Mr. Cohen put perspective into my own writing about technology that was so missing - the lives of the founders. First of Stanford, then Silicon Valley, then the elitist culture we have today. Here is a beautifully constructed chronology of one generation's quest (1950's) to improve the human condition with machine intel leading to the next and the next generation of digital companies in it for pure profit and, more dangerously, controlling human behaviors. My highest recommendation is given. 5,0 de 5 estrelasWarning..! Warning..! Warning..? OK - so I come at these issues from a rather opposite end of the spectrum. But, you know - something IS wrong with the internet, and Cohen is part of this early vanguard that is trying to pin down the problem and the solutions. 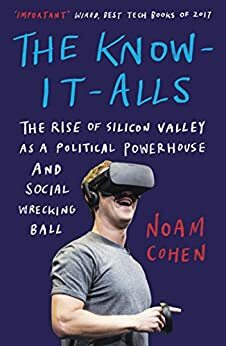 I think the strongest parts of the book are the profiles of successful internet pioneers -- and how they essentially took over the medium from the early hacker culture that, for all its quirky characters, would never have imagined that the internet would become the pinnacle of twenty first century capitalist culture. But that's what has happened - and the question is: is that ok? Cohen is the guy waving his arms, warning us that it's only going to get worse. Our society and social structures will all become pawns in this ever expanding technological universe. Do we have the will to stop it? Now, my question is: stop what? After all, the internet is more than Facebook. In fact, I don't know a lot of people who use Facebook. And some of us have very thin relationships to Instagram, or Pinterest, or Youtube. And Google? Maybe it's not the world's greatest company, but I turn to it a thousand times a day. And many people from all walks of life with all kinds of personal and political agendas use it fairly effectively. And yet we see how the internet has polarized our country, politically. How it is used to distort reality, or impose perhaps a reality that we pretended or did not know existed. All of these things to me are mixed blessings, really. Cohen senses danger. I think we are well advised to watch these developments carefully. The world seems busier and weirder all the time. It's possible, that in some yet unfulfilled way, Cohen is sounding a warning that we ignore at our peril. This book is well researched and very interesting and good. I got a lot out of it, and will read it again there is so much in it. The book’s central tenet (revealed in its title) is accurate and well supported. The long detour on the early history of computer science and early AI thought leaders is a slog, however. And chapters organized around individuals slows and confuses the development of the arguments. A long form Times article would have been a better form. And lose the footnotes. We believe you.